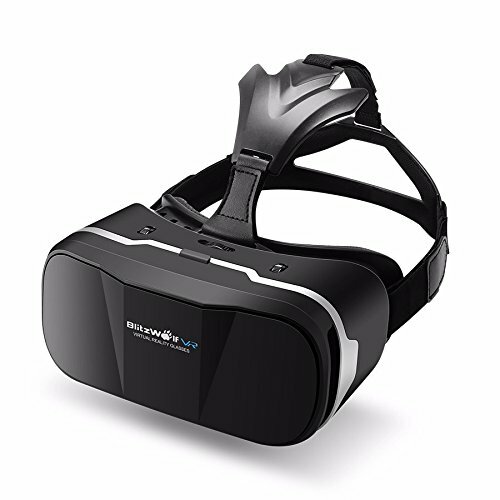 Improvement of BW-VR3 than other existing VR headsets. Hold up to 6.3" phone while others are still limited to 6", which means now the VR can easily hold big phone like Nexus 6P, iPhone7 Plus/6s Plus, Oneplus, LG G4/G5, Sony Xperia C5, etc. The phone clamp might be sticking at the volume button previously, now it's worry-free because the clamp is designed to be movable to hold your phone properly. For different shortsighted of both eyes, now you can adjust the lenses individually to meet a perfect degree of both eyes instead of setting the focal distance only to the same position. 1.This VR can't automatically transform images to 3D format, you need to download APPs with 3D format video or watch panorama videos on YouTube, QR code and video source can be found on Google. 2. You can connect with your headphone via the open port on the both sides of the unit. Latest Version of VR -- After 130 times anti-throw experiments and 72 hours high-temperature experiment, BlitzWolf VR headset offers strong quality and suitable design for wearing, its new structure will show the immersive 3D virtual reality vision. Eyes Protecting & Comfortable -- Lenses are upgraded to be more smooth and purified, with 42mm Mitsubishi aspherical FOV108 lenses, 8-layer nano-coating and 5-time polished, soft and detachable leather padding keeps you feeling good even after hours watching. Compatible with Larger Phones(6''max) -- BlitzWolf VR3 has larger adjustable rubber clamp that fits for 4.7-6 inch cellphone such as Nexus 6P, iPhone 6 6s 7 Plus, One Plus, Samsung S7 Edge, etc, while the phone clamp is slidable, your phone's volume button will never be obstructed. Adjustable Pupil and Focus Distance -- The headset can adjust pupil distance in 55-65mm and can also cater up to 500 degrees of shortsightedness, each eye can be focused individually for different shortsightedness. Download 3D Video Apps -- Works with over 500+ iOS/Android virtual reality apps. This VR can't automatically transform images to 3D format, you need to download APPs with 3D format video or watch panorama videos on YouTube, QR code, Apple Store or Google Play. We suggest you could download Jaunt VR app or others from the app store. All video source can be found on Google.All video source can be found on Google. If you have any questions about this product by BlitzWolf, contact us by completing and submitting the form below. If you are looking for a specif part number, please include it with your message.